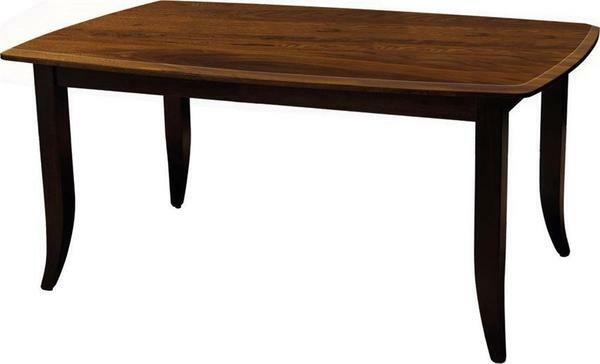 Our Christy Dining Table is the best of both worlds: refined Amish craftsmanship and smooth, contemporary design. Gather loved ones around this rectangular, solid top version. Christy design features a bow-shaped top with 2" beveled edges. Legs are nimble on flooring, featuring tapered construction with a slight flare. If a table with extensions is in order, see our Amish Christy Extension Table. 3 lengths available: 60", 66", 72"
This table is designed to accompany our Christy Chair, a popular choice for dining room seating. Order a set of stain samples to confirm your choices, and speak with an Amish furniture specialist for assistance! The Christy Table is also available with a square top in multiple heights.